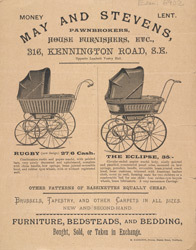 This is an advertisment for May and Stevens, a pawnbrokers store in Kennington Road. Pawnbrokers would give money to customers in exchange for goods deposited there. The deposited goods would be sold if the money could not be found to buy them back after a set period. Many were open late on Saturday nights and accepted all types of property from linens and clothing to furniture or jewellery. Proprietors would often sleep in the storerooms above the premises to protect the goods. It was usually members of the working class who made use of the services of the local pawnbroker.